Students from all classes and schools are invited to explore opportunities during this two-day event. Over 110 employers will host booths from a variety of sectors: nonprofit, education, startup, early stage, government, and private. Resumes are not collected. Employers simply talk about their internship and entry-level opportunities in an informal setting. Faculty and staff are encouraged to stop by! 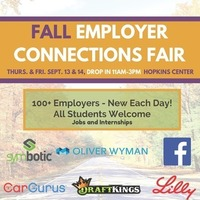 Stop by anytime between 11am-3pm on September 13 & 14 in the Hopkins Center! There are COMPLETELY new employers each day!